I had been in the Philippines as a volunteer for five months and had been praying for extra ways to help out in the seaside village of Pagudpud. Dr. Mitzelfelt peered at me expectantly through his bifocals. I sighed and thought of Thelma with her dull brown eyes. Her left side had been paralyzed from a couple of strokes, and she compensated for this loss by using a crutch and dragging around her foot. She didn’t smile or talk much, and her muscles were stiff and curled from lack of use. 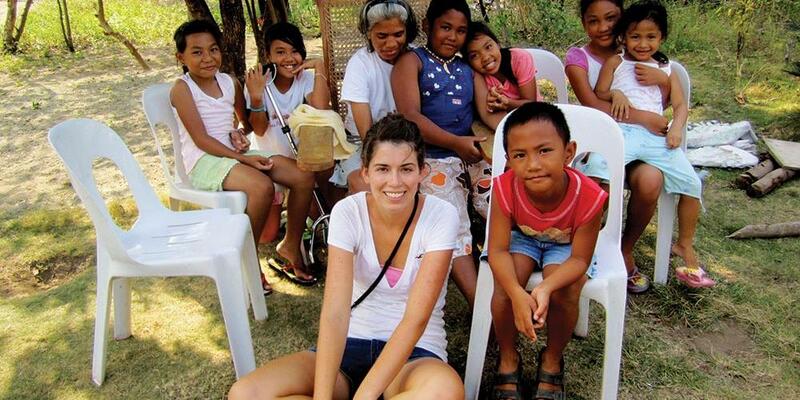 I had been in the Philippines as a volunteer for five months and had been praying for extra ways to help out in the seaside village of Pagudpud. So the next day I set out for Thelma’s house, stopping to ask for directions along the way. Finally, I found her family’s home—two houses, really, filled with uncles and aunts and many young cousins. Those first few days with Thelma were awkward and difficult. While she watched TV, I would sit beside her on the bench in her house and unclench her gnarled fingers, straighten out her stiff elbow, and bend and unbend her wrist. Thelma’s muscles were so stiff that at times I could barely move them. I begged her to walk short distances or have her family members stretch them when I wasn’t there. But I don’t think she ever did. I never saw much change in Thelma’s muscles, but I did start to develop a friendship with her and her family. They would always bring me a drink and some crackers—maybe sticky rice if Thelma’s sister-in-law Yeng had been in a cooking mood. Sometimes Thelma would want to talk; other times she would just sit and watch her soap operas. Toward the end of the year, as the days grew even hotter, I would find Thelma sitting in a rocking chair outside in the shade, wiping her brow. “So hot!” she would lament to me as I manipulated her sweaty hand. Sometimes we’d sit in companionable silence; other times she would talk about her travels or the places she wanted to visit. I had often wondered how Thelma could stand such complacency—sitting in that chair for hours on end while life passed her by. But as I spent more time with her, I began to almost envy her tranquil life. Sitting under the palm trees brought her such peace, and I found it pleasant to be with her, watching her nieces and nephews play in the yard or the old women on the porches fan themselves as the relentless sun blazed down. I liked this peace, and I liked Thelma and her family. I didn’t want to leave them, but soon the end of April arrived and it was time to go. “You will not leave,” commanded Thelma, a few mornings before my departure to the United States. “You will stay here.” But of course I had to leave. I left the family and the rice cakes and the palm trees and the old rocking chair that held the precious woman who had become my friend. It’s amazing how a few months in another country can change the way you think. I had been searching for peace and purpose in large areas and big plans, and here I had found what I needed in a little yard in the Philippines. I had gone there thinking I was going to make a big difference, when really the people there were the ones who made a difference in me. Thelma and her family had blessed my life and given me peace, and I believe that the few months we shared together were gifts from God, given to each of us in our time of need. Rainey Davis is studying occupational therapy at Loma Linda University in California, a career choice confirmed by the joy she experienced helping Thelma. She volunteered in the Philippines as a medical clinic assistant for In His Service Amianan.